Jim Lahey, of New York’s Sullivan Street Bakery, dropped a bomb into the world of bread-making with the 2006 publication in the New York Times of his recipe for no-knead bread. He isn’t the first baker to come up with a no-knead method, but he is the first to go large with it, first in the Times, then in his 2009 book MY BREAD, and now in his brand new MY PIZZA. His formula for no-knead bread is the most downloaded recipe in the Times’s history, probably because it produces a decent European-style loaf with a crackling crust, even for inexperienced home bakers. There’s no doubt Lahey’s method – more water, less yeast, more time, and baking in a preheated cast iron pot – has advanced the quality of homemade bread by a country mile (and brought a sigh of relief to standing mixers everywhere). He has introduced slow-rise craft breads to many folks who would otherwise find bread-making too arcane, too time-consuming or who just can’t stand the thought of throwing away another scrubbee clogged with bits of raw dough. Lahey’s technique hasn’t had much of an impact on me. I prefer sourdough recipes, with no added yeast at all, and I generally fold the dough several times during the initial rise to develop the gluten structure, a task that keeps me in touch, literally and figuratively, with the dough’s progress. Then Why knead?, in the face of easier, less fussy alternatives? As soon ask, Why sail? when there are gasoline engines. Why read a physical book? when there are digital copies. For the sheer anachronistically tactile relish of it. Because, once in awhile I crave the mindless unbridled sensual abandon wholesome exercise of grasping and squeezing and stretching a shaggy dough until it comes together. My wife, however, while respecting my inclination for sourdough, is also a model of efficiency when necessary. She’s made Lahey’s recipe several times. One occasion involved a kitchen full of college seniors who thought the line, “This pizza, she no need crust!” the apex of hilarity. Herewith this post. I will offer one minor observation of the technique as it pertains to pizza. It results in a slightly less chewy dough than I prefer. Not bad, just different. You be the judge–and let me know what you think. Makes 4 10-12 inch pizzas. 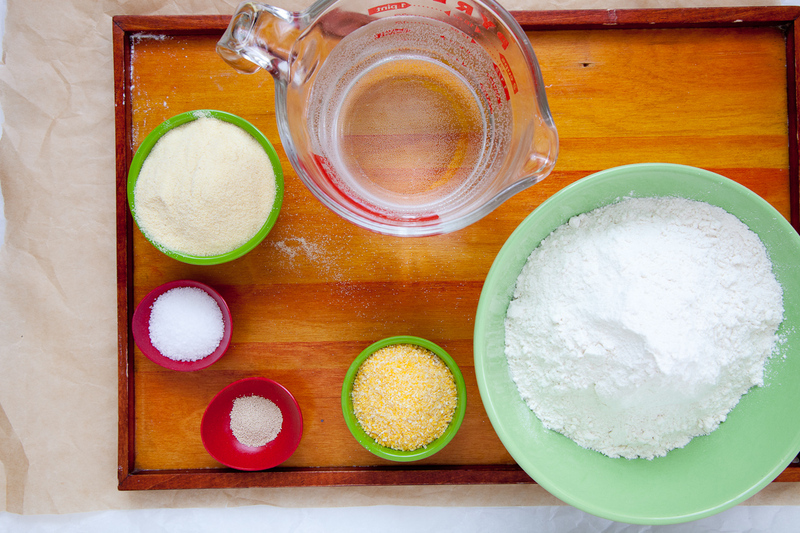 In a large bowl combine flour, semolina, cornmeal, yeast and salt. Add the water and stir until blended. The dough will be shaggy and sticky. Drizzle the top of the dough with the olive oil, cover the bowl with plastic wrap and let it rest at room temperature (about 68 degrees) for 24 hours. After resting a day the surface of the dough should be dotted with bubbles (if not, it may need to rest longer). Gently remove it from the bowl and place it on a lightly floured a work surface. Sprinkle it with a little more flour and using a bench scraper, fold it over on itself three or four times (see photos). Dust the top with flour. 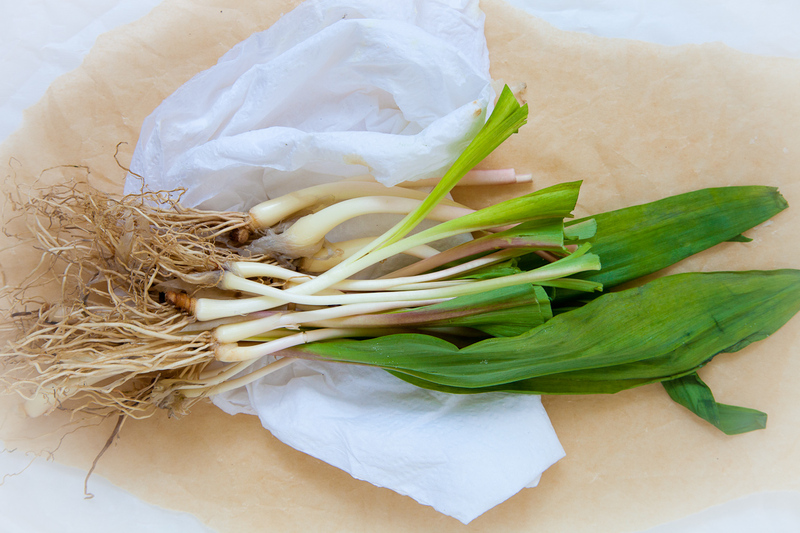 Cover loosely with plastic wrap or a tea towel and let rest about 15 minutes. After it finishes resting cut the dough into 4 equal pieces and gently roll each piece into a ball. Generously coat a tea towel with flour. 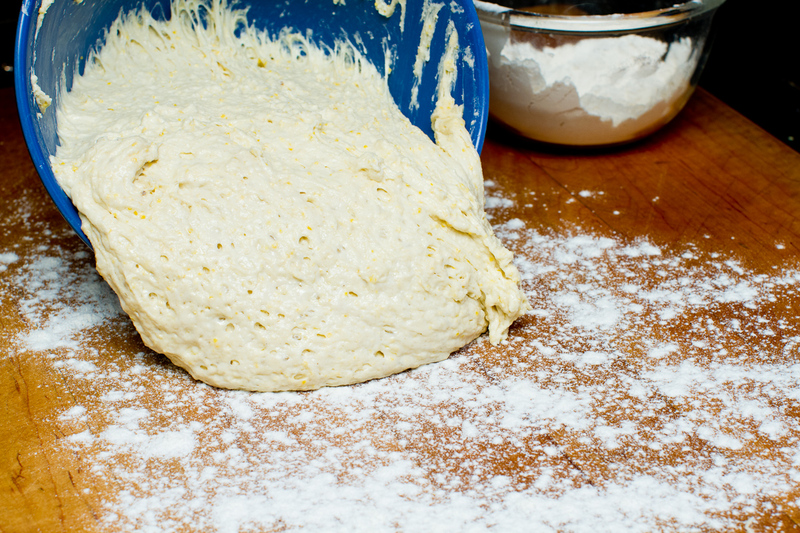 Put the dough balls seam-side down on the towel and dust with more flour. Cover with a second tea towel and let rise for about 2 hours. (This might be a good time to make the toppings.) The dough balls are ready when they’ve at least doubled in size and don’t readily spring back when poked with a finger. An hour before the dough is ready heat the oven with a pizza stone to 550 degrees. On a well-floured surface, flatten each ball just enough to resemble a rough disk. Turn one of the disks in your hands, letting it hang as you move your hands along the edge, gradually stretching it into a circle. 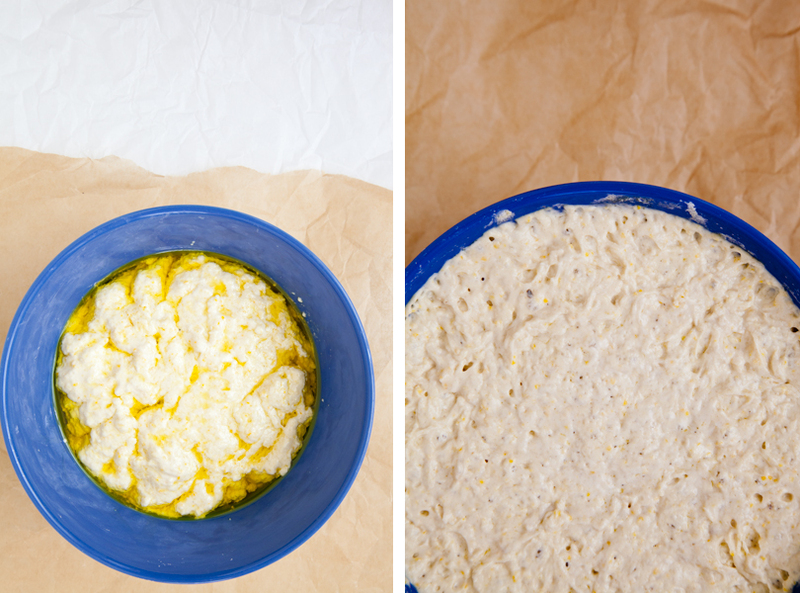 This dough stretches very easily–gravity will do most of the work. Don’t try to stretch each ball into a full circle all at once. Give each circle a rest when you reach 6 – 8 inches across, moving on to the next circle. After you’ve gone through all of the disks go back and finish stretching each circle until it’s 10 – 12 inches across. If you tear a hole in the dough lay it flat and pinch it closed. Dimple the dough with your fingers to keep it from puffing up in large bubbles. Transfer one of the dough circles to a cutting board or pizza peel liberally dusted with cornmeal or semolina. You want the pizza to slide off the board without a hint of sticking. At this point you can par bake each crust for 3 minutes, then remove it from the oven, add toppings and bake 10 minutes more. 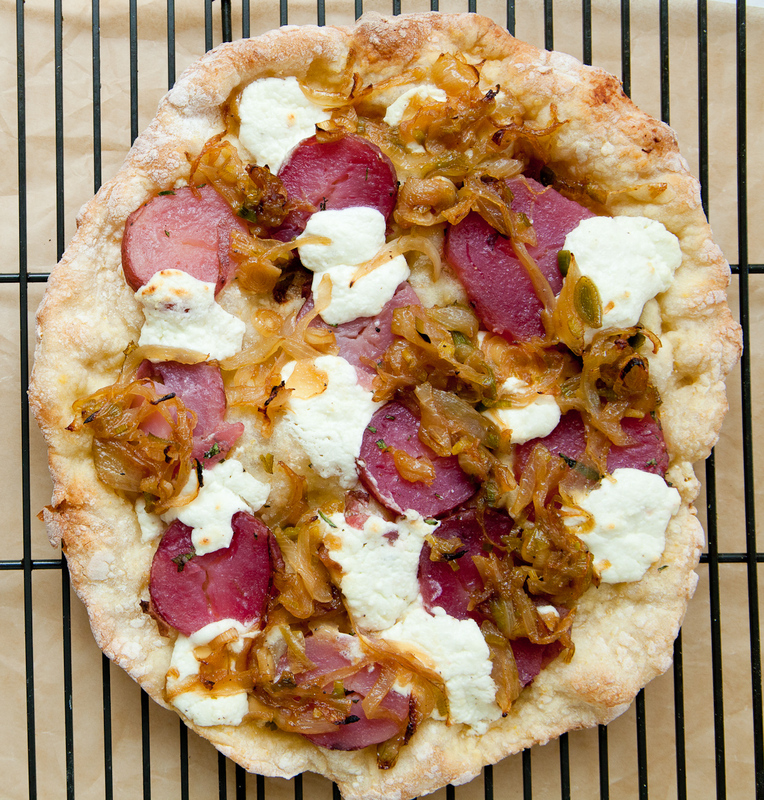 Or you can simply cover the dough directly with toppings and bake on top of a very hot pizza stone. Top each pizza with a fourth of the sliced potatoes, then dollop a fourth of the cheese mix and the onions around the potatoes. Bake until the crust is golden, and the cheese has melted, 8 – 12 minutes, depending on the temperature of the oven and the thickness of the pizza dough. While pizza is baking toss the greens with olive oil, lemon juice and salt and pepper. Transfer the pizza to a wire rack above a cutting board so it can cool for a minute. Brush the edges with olive oil. 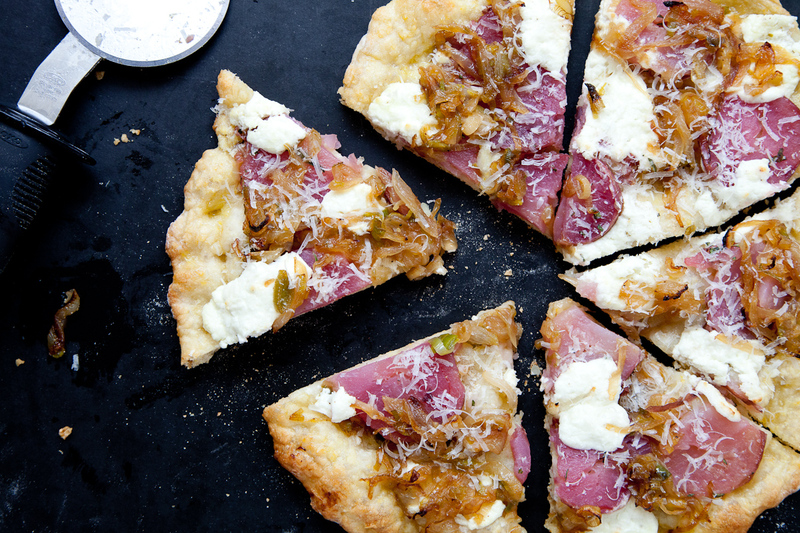 Slide the pizza onto the cutting board and slice. Top with the greens and a generous helping of freshly grated pecorino, and serve. Heat the olive oil in a large heavy-bottomed saute pan over medium heat. Add the onions, season with salt and pepper, cover and cook 15 minutes. 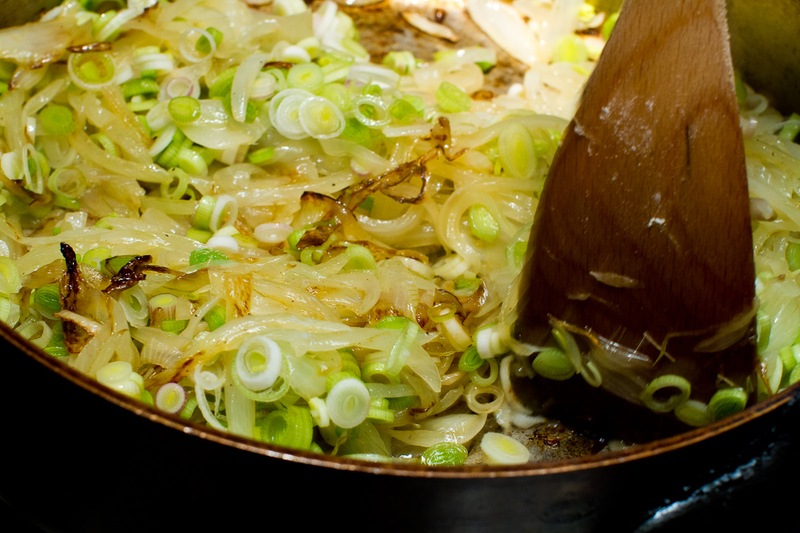 Uncover, increase the heat to medium high and cook 10 minutes to lightly caramelize. 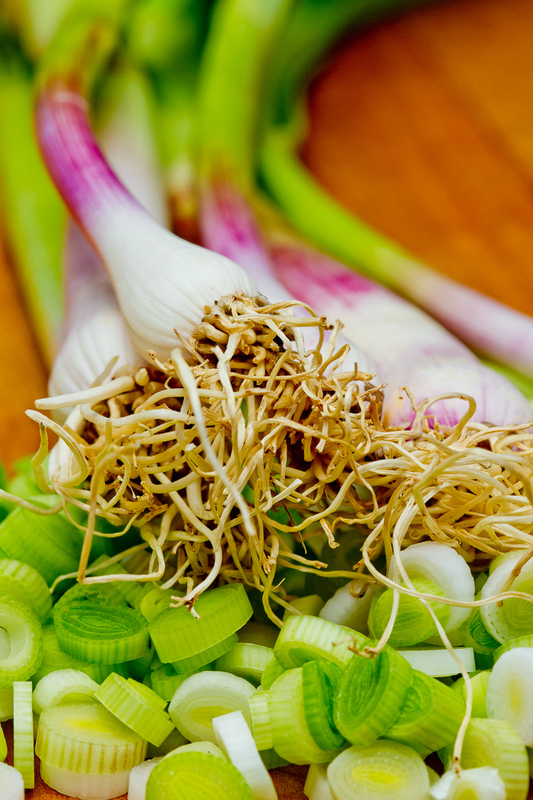 Lower the heat to medium, add the green garlic, cover and cook for 10 minutes. Add a squeeze of lemon juice. Remember the vegetables will cook again on the pizza so don’t let them get too dark. 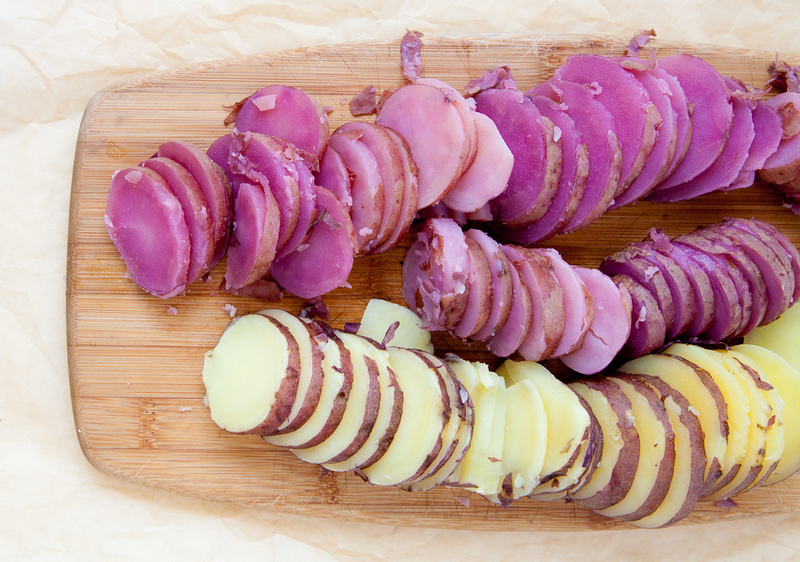 Season the potatoes with salt and pepper and toss with the savory. 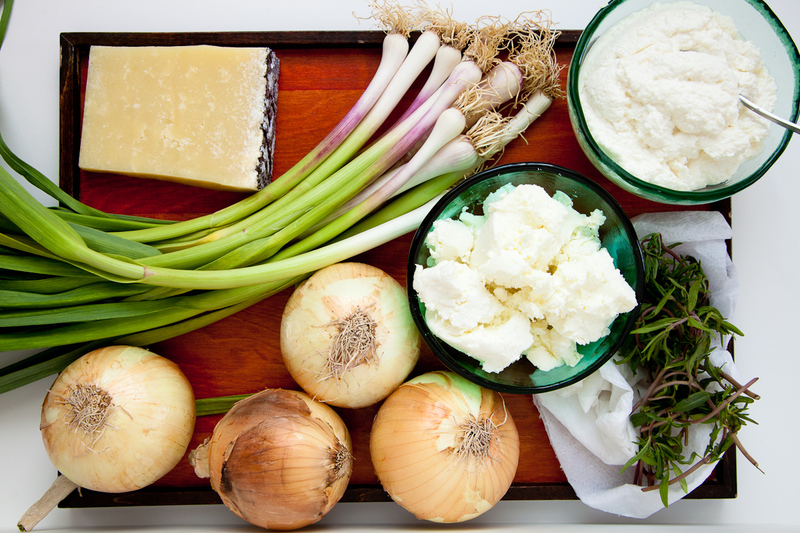 Mix the ricotta and goat cheese together and season with salt and pepper. The secret to a good pizza is a completely baked crust, including the crust in the center of the pie. 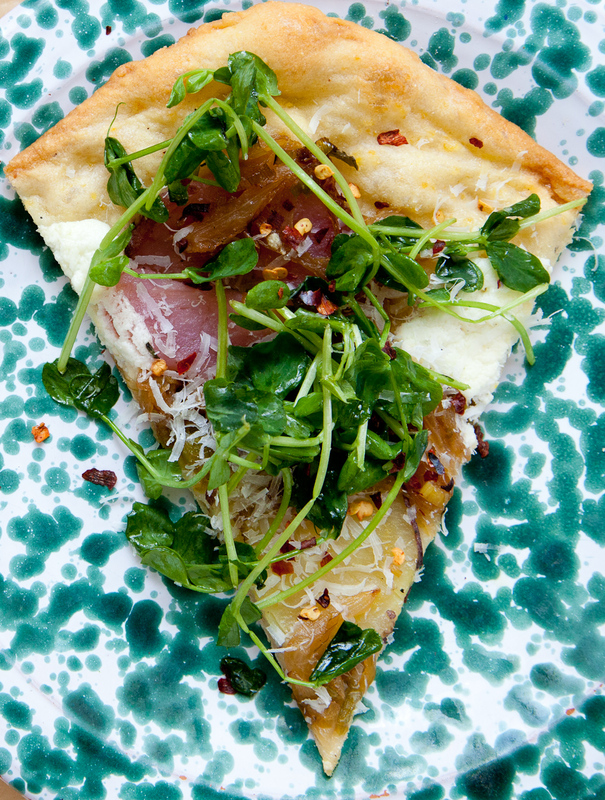 You should taste the crust, not just the toppings, in every bite. Make sure the dough is stretched think, show some restraint with toppings, and then use a very hot oven. If the dough is too dense or too thick, the crust will be underdone. If there’s too much stuff on top or the oven isn’t hot enough, the dough in the middle of the pizza will be soggy and limp. Ken thinks the safest thing to do is to par bake the crust without toppings for a few minutes just to let it set up, then add the toppings and finish baking. 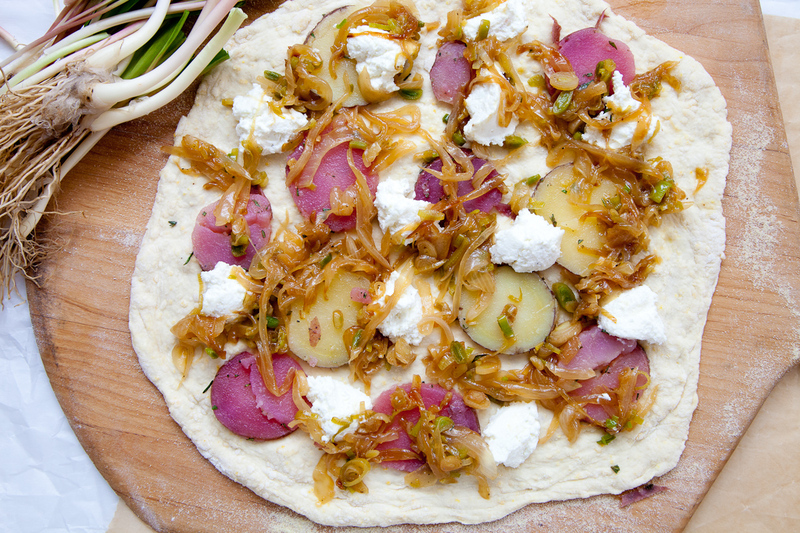 But if the crust is thin, and you’re careful not to use too heavy a hand, you can simply add the toppings to the raw dough and bake everything together. That’s what I do. I love adding some dressed raw greens to pizza. They taste great, add a little textural pizazz, and you get some salad before you’re too full. To be perfectly honest, I like the convenience of this crust but I do miss the texture of a kneaded dough. I love posts with the word “easy” in the title, you should have included “delicious” in the title of this one too. We (meaning Chris) have been making Lahey’s no-knead bread recipe for a few weeks now, and are LOVING it. 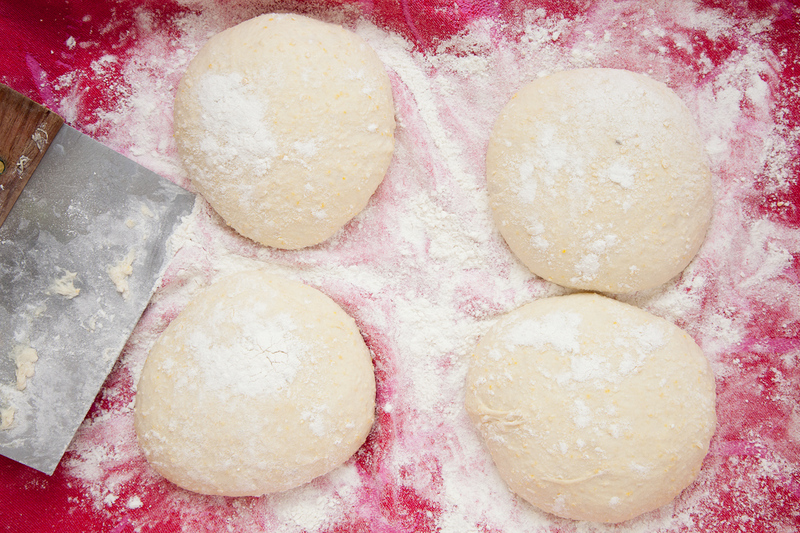 We haven’t tried the dough for pizza yet, but with you as our guides I’m sure we’ll be following along soon. 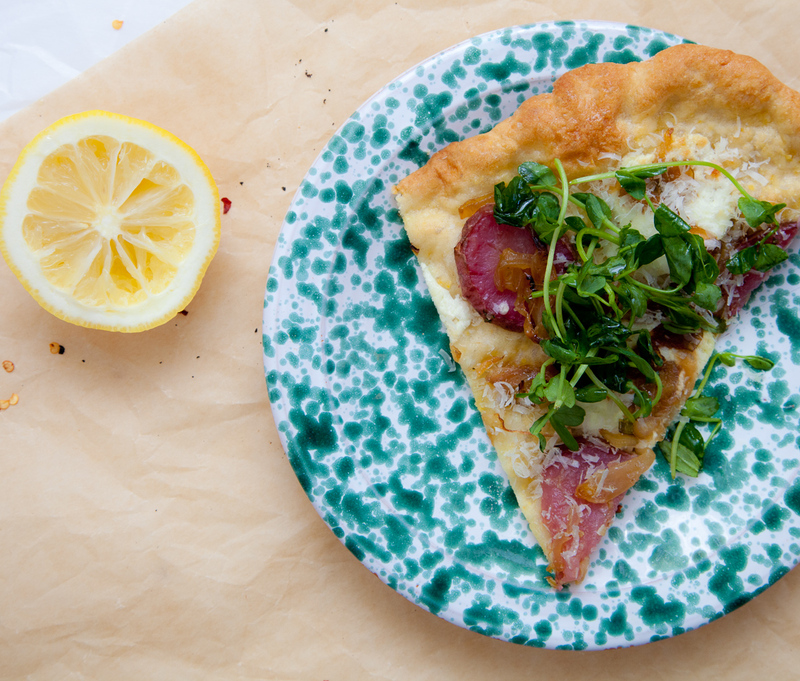 Aha, this is the pizza I can make for MYSELF on pizza day (every Saturday). My sons think pizza is one of the four basic food groups (or however many there are now on the food pyramid or plate or whatever it is now). So I’ve been making Reinhart’s 100% whole-wheat version (which does get kneaded in the stand mixer) so I don’t feel so bad about it. However, they only want cheese and tomato sauce on it. I’ve suggested other toppings and I get a gently condescending “silly mommy, that doesn’t go on pizza.” Oh well. They enjoy helping me make it (and eat it) so it’s all good. I wonder how Lahey’s method would work with whole wheat–Reinhart’s technique involves lots of resting to hydrate the flour so could be. 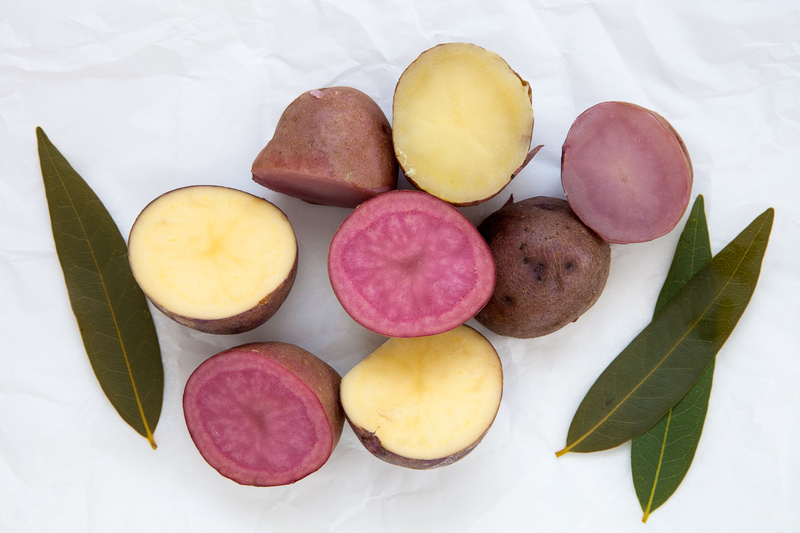 Love the idea to throw bay leaves in the water while cooking the potatoes! Have you seen this? http://www.davidlebovitz.com/2012/04/french-appetizers-dukkah-feta-wrapped-with-prosciutto/. You may have kick-started a trend and earned the title: Doyen of Dukkah. As a former Jersey girl, I have strong opinions about pizza and suspect I will share your sentiments about the trade-offs between convenience and crust crispiness. Made the flageolet bean soup this week. Perfect antidote to a cold, blustery spring day. Clearly there’s nothing you can ‘t do with dukkah. Oh, Ken. A great description as always. And I’m glad it included the edited part “the mindless unbridled sensual abandon” which you clearly tried to change to “wholesome exercise.” Hope there is a book of these recipes with your erudite and witty introductions in our future. I have been meaning to try the Lahey pizza dough, since, as you may remember, I faithfully make the jim lahey bread almost every week (though trying to cut down on bread, and having such good loaves around makes it hard.) So….’why sail?’ indeed! We’ve (collectively) become lazy bones about so many things–I want to put this to the test side by side with some regular pizza dough one of these days soon. p.s. Sometimes I make bread with more flour (not as sticky as prescribed)–and it still comes out great. Wonder if that would make it chewier? p.p.p.s. I signed in with a weird account that takes you to a place that doesn’t really exist. Maybe ‘this’ is really all an illusion after all…. I’m also a fan of the more water, fold a few times, rise longer approach. I think it’s one that Chad Robertson of Tartine in San Francisco uses too. I’ve made some of the breads in his book and they’ve turned out wonderfully. My current favorite pizza dough however is from Mozza by Nancy Silverton. I highly recommend trying it. It blew my old recipes out of the water! 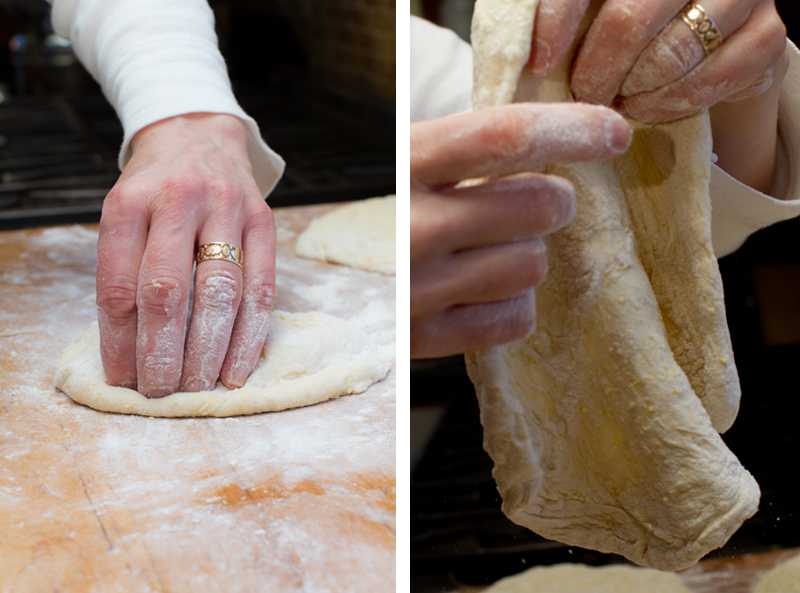 The whole experience of making your own bread and dough is the kneading process! When I first started making bread, I would always stop kneading too early. I’ve learned to take my time and enjoy the process. Regardless, your pizza still looks delicious.